Much freedom of movement on the ground and easy sliding back into the seat after takeoff – these are two of the strengths that show off the AXESS 3 AIR. 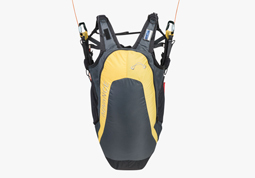 In addition, redesigned harness geometry makes adjustment simple, and improved back support offers excellent comfort. 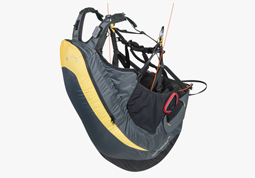 The AXESS 3 AIR has an exceptionally small packed volume, due to the highly compressible Hybrid Airbag. 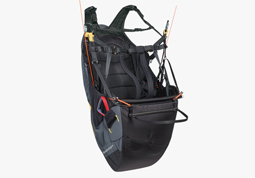 Delivered with a carbon seatboard as standard, this allround harness has an impressively low weight of around 3.5kg. The AXESS 3 AIR’s elegant look is a result of ADVANCE 3D design technology. The Hybrid Airbag automatically takes on its working shape and full volume immediately after unpacking. The foam framework inside the protector makes sure that it directly and independently fills with air while still on the ground – without the need for continuous airflow. This novel system provides a high level of passive safety, from the first to last moment of your flight.